It’s hard to believe Accela Engage 2015 is almost here! Many of us here at Accela have been working hard for months to make sure this is a great event. From planning the presentations, sessions and training to the event logistics and fun activities (like Paramount Studios Monday night for our Customer Appreciation Dinner! ), the office has been a whirlwind of activity. 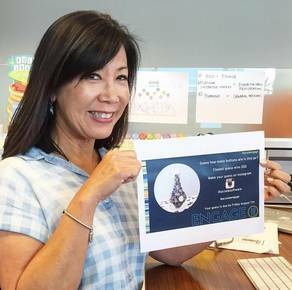 To lighten things up a bit, we recently had a “guess how many pins are in a jar” contest, and the winner is the woman whose team is responsible for much of the design work you’ll see at Engage – be sure to tell her what an amazing job they did when you see her in LA! I’d also like to give a huge shout-out to master event planner Candice Nepomuceno, who is the wizard behind the curtain for this year’s conference. internal contest and get everything ready for Engage with her design team! It hasn’t only been us, though – many of our customers and partners have been busy getting ready as well. We’re fortunate that a number of our customers have volunteered to share their success stories and best practices during sessions at the conference, as well as on stage. The same goes for our partners. Featured Speakers: We are fortunate to have some innovative and dynamic speakers, including Abhi Nemani, Chief Data Officer for the City of Los Angeles, and Jennifer Anastasoff of the U.S. Digital Service. Over 60 Sessions: Haven’t locked down which sessions you want to attend? Take a gander at the agenda. Accela Expert Desks: Get hands-on product support, demos and answers to all of your questions. Schedule time or just drop in! The Expert Desks are open during Conference hours and closed during General Sessions. Exhibit Hall: We are very selective when it comes to our partners. Learn about complementary services and solutions from more than 20 exhibitors and sponsors. User Group Meetings: There are plenty of opportunities to meet attendees from other agencies during the conference, including regional user group meetings on Monday and a national/international user group meeting for all customers on Tuesday. Networking Social and Raffle: Stop by the Exhibit Hall on Monday and Tuesday at 3:45 pm for snacks, good conversation and a chance to win prizes donated by our exhibitors (you must be present to win)! Snacks will be provided by Accela and our sponsors. Customer Appreciation Dinner: NYC in LA? On Monday night, experience Hollywood glamour as you’re transported away from Tinseltown to the Big Apple at Paramount Studios. We’ll be rolling out the red carpet (literally!) for our valued customers. We’ve worked hard to create interesting educational and networking opportunities on top of interesting keynote speakers and general sessions, fun activities like the Customer Appreciation Dinner and more sessions than ever before. Take a few minutes to plan your agenda so you can be sure to get the most out of Accela Engage. We look forward to seeing everyone in Los Angeles next week!